If reading Axios each day isn't enough, you're in luck. Dan Primack is launching our first podcast, Pro Rata, next week. You can subscribe here. Bonus: I'll be on there from time to time talking tech and reminding him that the Warriors rule and the Patriots cheat. The EU has imposed a record $5 billion fine on Google for its Android business practices — but the biggest impact is likely to come with new rules for how the company does business. At issue: Historically, Google has required Android device makers that offer its Google Play app store to pre-install Google’s own applications. That’s the biggest of a variety of practices the EU says Google uses to maintain its dominance. The $5 billion penalty (4.3 billion euros) is higher than the 2.4 billion euro fine that EU competition chief Margrethe Vestager hit Google with in a previous case about online comparison shopping. Google now has 90 days to end its “illegal conduct.” But the company says it intends to appeal the decision. Why it matters: Looking back to the Microsoft antitrust case 20 years ago, the fines were the least of the firm’s issues. More troublesome for Microsoft were specific conduct remedies the EU ordered, such as forcing Microsoft to allow PC buyers there to choose a rival browser. But the biggest impact was the change in thinking that its antitrust ordeal forced upon Microsoft, which heavily weighed future business decisions based on how they might be viewed by regulators in both the U.S. and Europe. Google CEO Sundar Pichai’s take: “The decision ignores the fact that Android phones compete with iOS phones…It also misses just how much choice Android provides” to phone makers, app developers and consumers. Beyond Mountain View: Google has been hit hard in Europe. So far, however, both Facebook and Amazon have avoided this level of scrutiny, despite growing fears about their power. What's next: We'll be watching whether this move widens the gap between Brussels and Washington, where antitrust enforcers have thus far been wary of taking on Big Tech. We’ll also watch how it plays out in the larger picture of EU-U.S. tensions provoked by the Trump administration’s trade moves and rhetoric. Go deeper: Axios’ Sara Fischer has more on the EU’s move against Google. This week brought a further reminder of how fragile much of the internet has become. In addition to its reliance on several core pieces of physical infrastructure, the network is also increasingly dependent on a few cloud providers, namely Amazon, Google and Microsoft. 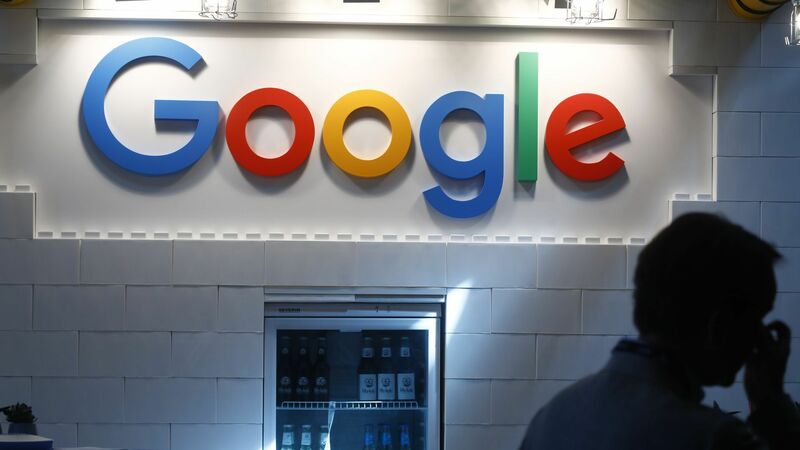 A recent example is a Google cloud services outage on Tuesday that shut down everything from Spotify to chat forum Discord to online game Pokémon Go. Many others rely on Amazon or Microsoft for cloud services. Monday's Prime Day glitches, for example weren't tied specifically to Amazon Web Services, but past outages of AWS have taken out even larger swaths of the web than did Tuesday's Google glitches. Parts of the infrastructure that forms the backbone of the internet — from fiber optic cables to colocation facilities — is at risk of being flooded and knocked offline during the next few decades as a result of climate change-related sea level rise, according to a new study. The study, by researchers at the University of Wisconsin and University of Oregon, concludes that sea level rise is not a far-off problem for the end of the century, but rather a "devastating" risk that the U.S. telecommunications industry faces in as little as the next 15 years. Go deeper: Andrew has more here. In just four years, Amazon's invented Prime Day has become an event with as much clout as Black Friday and Cyber Monday, analysts report. And while this year got off to a rough start, the event (which ended at 3am ET Wednesday) was in many ways the biggest one yet, Axios' Marisa Fernandez reports. Why it matters: Amazon uses the event not just to boost sales and reward existing customers, but also to sign up new Prime customers. Prime customers are, like their name suggests, some of the company's most valuable ones. New Prime subscribers spent over $1,200 in the year after signing up, on average, compared to roughly $600 spent before having access to Prime, according to an estimate from Second Measure. But there are signs that membership growth is slowing down. Amazon Prime membership only grew 12% in the past 12 months, down from 35% growth during the previous 12 months, per Digital Commerce 360. One of the highlights: The sales were bigger than last year — not only with Amazon brands — but with notable retail brands like Calvin Klein, P&G and Samsung, ranging from 20-50% off. This year's Prime deals were better than Black Friday last year, per analysis from bestblackfriday.com. One of the lowlights: As mentioned in the top story, Amazon's website started suffering glitches and outages as soon as Prime Day started on Monday. That created headaches for customers and for the company, which scrambled to adjust limited time offers so customers had a chance to cash in on the deals they were looking for. What's next: Look for Amazon to tout how this was the biggest and best Prime Day ever in an adjective-filled press release and tune in for more details via its Q2 financial results that will be announced July 26. Go deeper: Read the full story here. In these days of tensions between D.C. and the tech industry, it can help to grab ahold of the things that unite both sides. Like the fact that both communities are bad at small talk, as captured in this Twitter exchange. 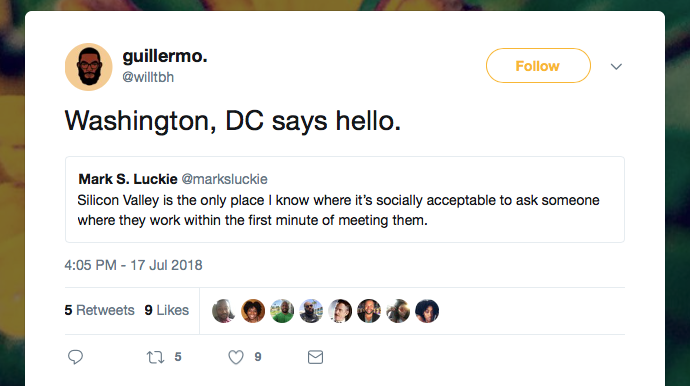 Facebook's Mark Luckie noted that Silicon Valley is the only place he knows where people ask each other where they work in the first minute of meeting them. A D.C. follower suggested the same thing happens there. Fortune's Brainstorm Tech wraps up in Aspen. Microsoft's Inspire partner conference continues in Las Vegas. James Heighington is taking a post at Google as global lead on strategy, policy & narrative, working on diversity and inclusion efforts, Axios has learned. Heighington was formerly GLAAD's chief digital officer (and also formerly James Halloran — he just got married and is taking his husband's last name). CNET reports that Marwan Fawaz is leaving his position as Nest CEO as the company further integrates the once independent unit into its broader home hardware operations. CNET also says that Google considered selling Nest to Amazon back in 2016. Texas Instruments is replacing its CEO after he was in that position for only a month, saying Brian Crutcher violated the company's standards. He becomes the third chip company CEO in recent months to lose his job over personal conduct issues, as MarketWatch's Jeremy Owens points out. Pokemon Go creator Niantic is buying Seismic Games. Twitter product lead Kayvon Beykpour said Twitter isn't prioritizing a restart of its "blue checkmark" program for verified users. Rather, he said the team is focused on things it can do to strengthen the platform ahead of upcoming elections. Google is building its second undersea internet cable, this one connecting France and the U.S.
Self-driving carmaker Zoox raised $500 million in funding. As I mentioned above, Heighington recently got married. What I didn't say is that his sister stole the show with her musical tribute of "Take My Bro" sung to the tune of "Let It Go." I've spent the last two days with the refrain stuck in my head — "Take my bro, take my bro. He's old and he bothers me anyway."